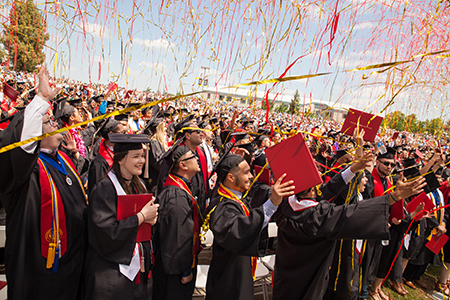 The largest graduating class in Stanislaus State history was honored during three commencement ceremonies May 25-26, as the University renewed the tradition of inviting keynote speakers  to inspire the graduates. Addressing all three ceremonies, which honored the 3,022 receiving degrees or credentials, Stanislaus State President Ellen Junn urged the graduates to heed the lessons of their heads, hearts and hands as they go forward in life. Brittney Silveira (B.S., Business Administration) received the Geiger-Metzger Student Award for highest undergraduate grade point average. Tatiana Olivera (B.A., English) was given the J. Burton Vasché Award, presented to the graduate who displays the highest standards of leadership, service and scholarship, and Elmano Costa, a professor of teacher education, was honored as Outstanding Professor. On Thursday morning, graduates from the College of Business Administration and College of Science were addressed by Foster Farms President and CEO Laura Flanagan, and the graduate and credentials ceremony that evening featured George Boodrookas, the dean of advancement at Modesto Junior College. Friday morning, graduates from the College of the Arts, Humanities and Social Sciences and the College of Education, Kinesiology and Social Work were addressed by Robert and Kim Ulrich, a successful Hollywood couple that married shortly after graduating from Stan State. Flanagan encouraged the graduates to never forget their roots and urged them to speak out. Student speaker and business administration graduate Brittney Silveira, who also received the Geiger-Metzger Student Award, reminded her fellow 2017 graduates that a diploma, while only made of paper, is a ticket to the future. Boodrookas, who earned his master’s and doctorate from Stan State, emphasized the importance of personal stories. Student speaker Alyssa Long, who received her teaching credential, expressed her pride for the accomplishments of her fellow graduates. On Friday morning, student speaker Jonathan Walters (B.A., English) drew heavily on his own experiences growing up poor in Southern California. Robert Ulrich, an Emmy-winning casting director who grew up in Stanislaus County, used lessons from his own career to inspire the graduates. To read more about some special members of the Stan State Class of 2017, visit our #StanGrad page .